Move over Barcelona! Yes, that’s right, Madrid is now becoming Spain’s capital of cool, so move over Barcelona! Don’t believe us? Well, check out the newly opened Ginkgo Sky Bar. It’s impressive! We’re just back from Madrid, so this news is hot. Madrid’s newest 5-star luxury hotel VP Plaza de España Design has created a new urban gourmet destination – on its 12t floor, the Ginkgo Sky Bar. Open for hotel guests, city residents and visitors too, this úber cool space includes terraces with spectacular views of Madrid, including the Royal Palace and Debod Temple. There’s a glass bottomed outdoor swimming pool, and sun bathing area too. But the pull for city slickers and visitors in the excellent restaurant serving contemporary Spanish cuisine. Glass walls slide open to let you enjoy the city buzz and see Madrid’s sunsets from the very best perspective. When it comes to dining Ginkgo Sky Bar celebrates the best of Spanish flavours with an on-trend touch of Asia. Starters include octopus carpaccio, fried artichokes and Jamón Iberico served with pan con tomate, whilst mains range from line-caught baby squid served with wok-fried vegetables, turbot with mushrooms and truffled vinaigrette to Galician sirloin with roasted piquillo peppers or a terrine of oxtail and foie. After dinner, continue the fun in the fully-soundproofed late-night Sky Bar with live music. Visit mid-week for jazz sessions each Wednesday from 10pm; and start the weekend early with DJ sets every Thursday to Saturday from 11pm. Sundays offer a more chilled musical style with a live band. At night a glass floor slides over the swimming pool to create more terrace space to enjoy the warm summer Madrid nights. What’s more, from above the pool one can look through the glass and water to the hotel’s signature sculpture, a 25m metallic waterfall sculpture (created by Catalan artist Pere Gifre) that appears to cascade down from the glass bottom swimming pool on the 12th floor, to the bottom of the internal courtyard, on the ground floor of the hotel. The Sky Bar is taking Madrid’s cocktail scene to new heights, with hipster mixologists that really know their stuff. 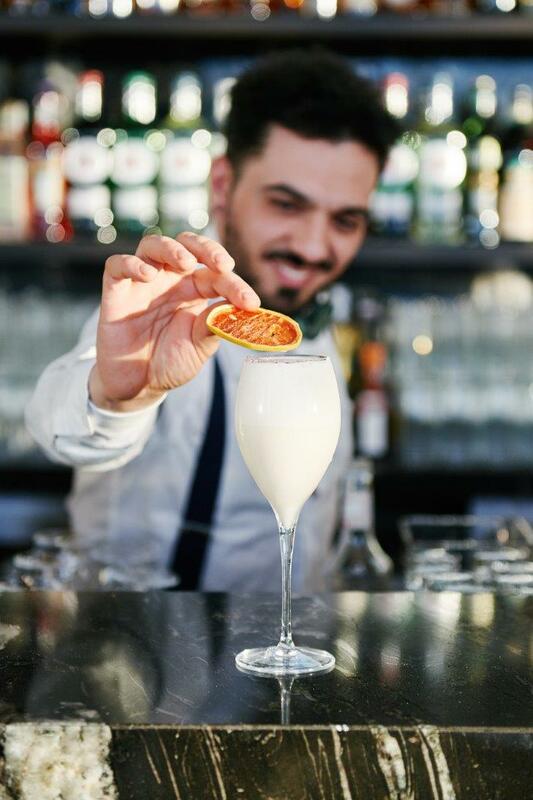 Enjoy a classic cocktail or a house special such as ‘Passion Bubbles’ made from Bombay Sapphire, lime juice and passion fruit hibiscus tonic or ‘Daquiri of the Rising Sun’ featuring Bacardi rum, yuza juice, ginger jelly and egg white. The 12th floor Ginkgo Sky Bar is set to become a meeting place for both Madrid residents and international guests. Ginkgo Sky Bar opens every day from Sunday to Wednesday 12:00 – 2:00am / Thursday to Saturday 12:00 – 4:00am.